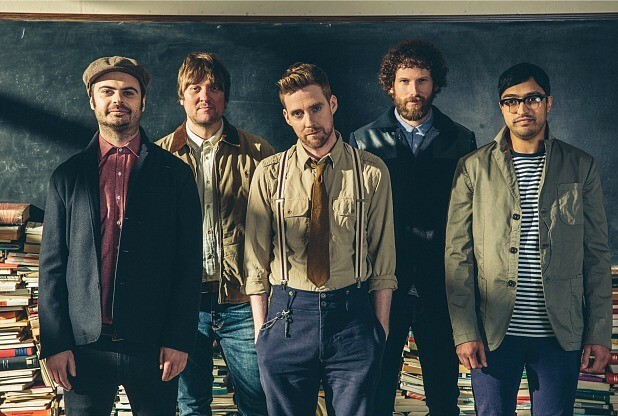 Most of those in the music scene in the North East of England will already be aware of the upcoming arrival of the Kaiser Chiefs to the North East as part of the British leg of the World Tour on the fifth of February, 2015. But if there was any more incentive to see the angry mob in action it comes in the form of a highly regarded set of support acts finally getting the opportunity to showcase their talents on the highest stage. Since their inception in 2010, Public Service Broadcasting have established themselves as one of the most original and quirky acts on the independent circuit. The group, consisting of J Wilgoose Esq. and Wrigglesworth, have made a name for themselves for their sampling of public information films in their music as part of their mission to “teach the lessons of the past through the music of the future,” referencing everything from Second World War aerial conflicts through to Edmund Hillary’s conquest of Mount Everest. It has lead to a unique and atmospheric sound which has been described as the Pet Shop Boys meets British Pathe. The group have been highly decorated and acclaimed in recent years with a mix of Krautrock and Synthpop almost reminiscent of that of Cabaret Voltaire, and given the opportunity to showcase themselves on the largest stage fans will be treated to a unique, enthralling and, unusually for a pop concert, educational musical experience. The local support for the night comes in the form of Newcastle’s own Trev Gibb, a relative yin to the yang of Public Broadcasting. Whilst PBS’s music is reliant on a harsh electric driving beat Gibb’s comes in the form of a velvet-lined vocal commending endearing vocals especially well, with comparisons to the likes of Edwyn Collins, Big Star and even Fleetwood Mac being thoroughly deserved. The chance for him to showcase his work in front of a massive local audience is one which is thoroughly deserved. Kaiser Chiefs, Public Service Broadcasting and Trev Gibb all play at Newcastle’s Metro Radio Arena on Thursday 5th February.